It's been an interesting time over in Twitter. Seems that some folks get a bit cranky when you challenge their belief systems. Sadly, 140 characters is hardly adequate to point out the flaws in their logic (if I may call it such). So, I brought it here and I'll provide them links. I expect the comments below to be filled with invective, erroneous logic, attacks on my character finally ending with the hoary chestnut, "I'll pray for you." Unlike many, I will not hide the names. You go on to Twitter with no expectation of privacy so take your lumps. Here we go with a classic theist dodge: use the Bible to prove the Bible as if that is somehow going to sway the ideas and opinions of an old atheist like me. Now on to the burden of proof. 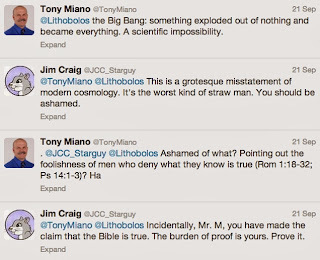 Mr. Miano's assessment of modern cosmology is, at best, incomplete. At worst, it's entirely misleading. 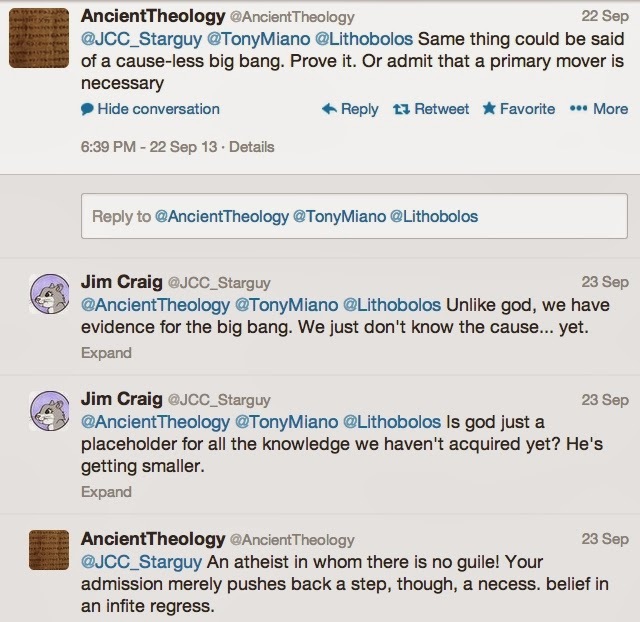 I know of no astronomer who works in cosmology who claims that the universe came from nothing. We do not yet know the origins of the universe but to say that "something exploded out of nothing and became everything" is complete drivel and Miano knows it. Speaking of what people know, he then says that men deny what they know is true. Naturally, he is referring to the Bible. He has now stated the Bible is true. I challenge him to prove it. From that point on, he disappears from the conversation and a guy who goes by Ancient Theology steps in. Do you see that easy dodge? Rather than prove a statement has been made, he has attempted to shift the burden of proof to me. 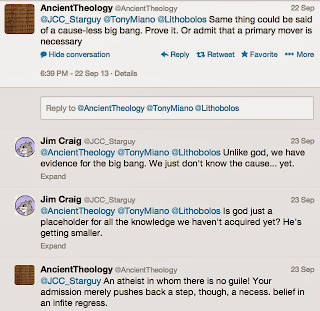 And, again, he has said that the Big Bang has no cause. 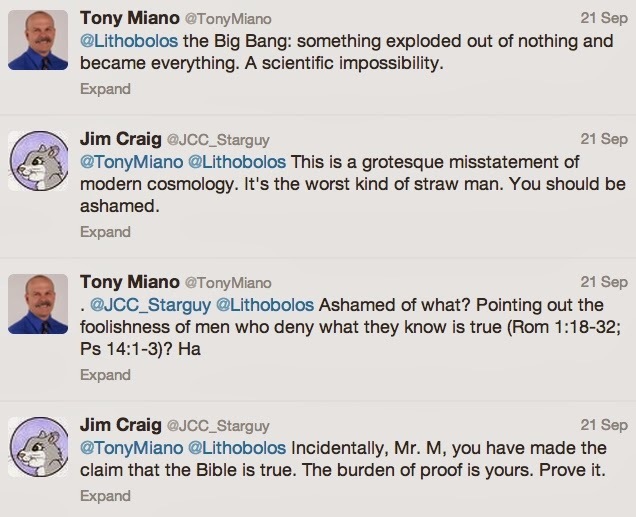 I still say that this is a gross misunderstanding of modern cosmology. My second statement to Ancient Theology sums up my feelings on the issue pretty nicely. At one time, gods were the explanation for everything that occurs in nature. As we learned more and more about the world around us, some of those gods vanished. Today, god has become nothing more than an answer for people who are content to be satisfied with incomplete answers. Once gods enter the equation, inquiry withers and dies. And he's right. I have no guile. Guile implies craftiness. Nope. Not me. I just make my statement flat out with no attempt to use emotion or coercion to demonstrate what I say. It's out there and you can accept it, refute it (with evidence) or ignore it. It's all the same to me. The conversation continues... so more later.